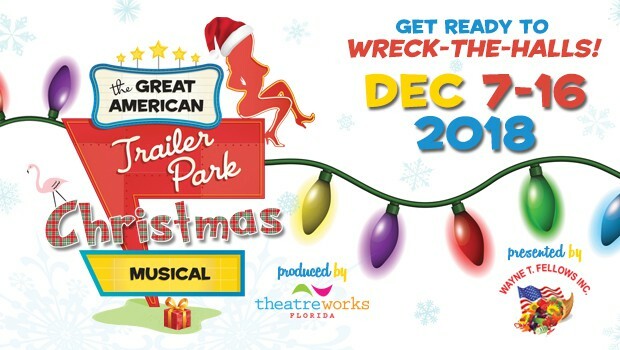 DAVENPORT, FL (SEPT 29, 2018) – For anyone that experienced last season’s outrageous sell-out of TheatreWorks Florida’s award-winning The Great American Trailer Park Musical, you already know that this holiday musical bash is about to “wreck-the-halls” with some “ho-ho-hos” and Keg Nog! Filled with some of Central FL’s most talented actors, including returning cast members from the original March 2018 Trailer Park production, you better buckle up for a wild sleigh ride to the other side of the tracks! Synopsis: It’s holiday time down in Armadillo Acres (North Florida’s premier mobile-living community), and everyone’s filled with warmth and beer. But when a freak bout of amnesia strikes the trailer park Scrooge, neighborly love is put to the test. Be on hand as Betty, Lin, and Pickles jingle all the way with some new neighbors in an all-new, all-trailer-park musical! This outrageous companion sequel to the original The Great American Trailer Park Musical is just as much of a cat-fightin’, sun-worshippin’, chair-throwin’ good time – but with Tinsel and Keg Nog! DON’T GET “SHUT OUT” BY A “SELL OUT” • GET YOUR TICKETS TODAY! Last year’s original “Trailer Park” show sold out within a few weeks of sales being announced. This year, the “Trailer Park Christmas” sequel is already 40% sold, demanding an additional matinee show be added. GET TICKETS TODAY before they’re gone like the Ghost of Christmas Past! Presented by: Wayne T. Fellows, Inc.
All performance times: Fridays and Saturdays at 8PM, Sundays at 2PM. NOTE: SAT DEC 8 performance is at 2PM only, not 8PM. SAT DEC 15 has 2 performances; 2PM & 8PM.